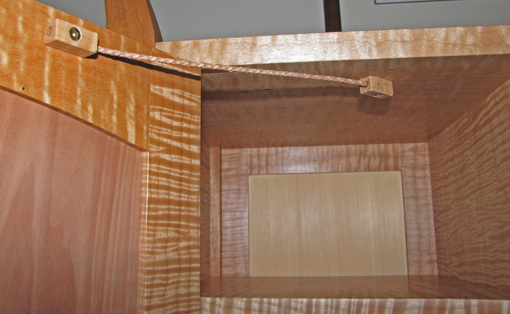 In designing cabinets and boxes, it is often necessary to limit the travel of a door or lid. Hardware options include folding stays, sliding stays, chains, and various types of supports. While some are purely practical and some more elegant, I did not feel any of the manufactured choices I was considering for this pair of small doors was in keeping with the overall nature of the piece. The problem was the metal itself – hard, noisy, overbuilt, and, well, metallic. I wanted this component to be quiet and organic, so I did some experimenting and came up with a wood and leather concoction that functions well and complements the overall piece. It is also simple. Braided bolo leather cord, 1/8″ diameter, in a tan color that matches the wood, is epoxied into a 1/8″ diameter hole going fully through the length of a 1″ x 7/16″ x 7/16″ maple block. 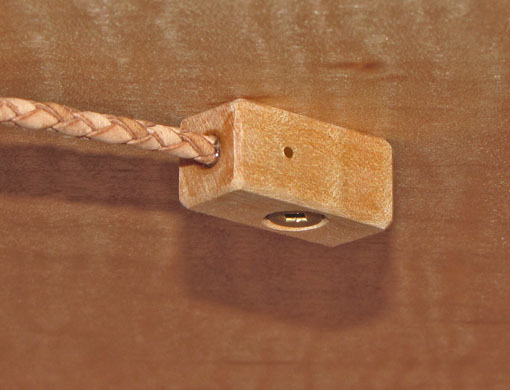 To further secure the cord, a brass 0.050″ wire brad (local Ace Hardware) is gently tapped through a slightly undersized hole crossing the width of the near portion of the block and passing through the cord. The pin is clipped and filed flush at each end. A small countersunk screw attaches the block to the door or cabinet interior. The diameter of the cord, up to ½”, and the sizes of the blocks and fasteners would be adjusted according to the overall size of the piece. I sized the components as seemed right for these doors which are about 16″ x 10″. In testing, I was able to break the 1/8″ cord with a strong pull but it certainly is adequate for its task in this project. I think the bit of desperation involved in the genesis of these stays ultimately helped produce a unique touch to the piece. 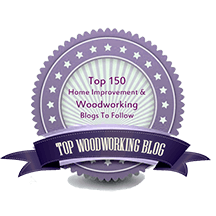 i have been following your setting up shop blog. when can we expect to read your choice machine number 3 and 4? As you go beyond the decisions for the first and second machines, for which I suggest portable thickness planer and bandsaw, respectively, the number of options decreases, there is usually more commitment to buy multiple machines, and one has a better sense of what is needed. 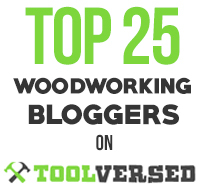 For most woodworkers, I would suggest the options to consider are: jointer, table saw, router with router table, and dust collector.